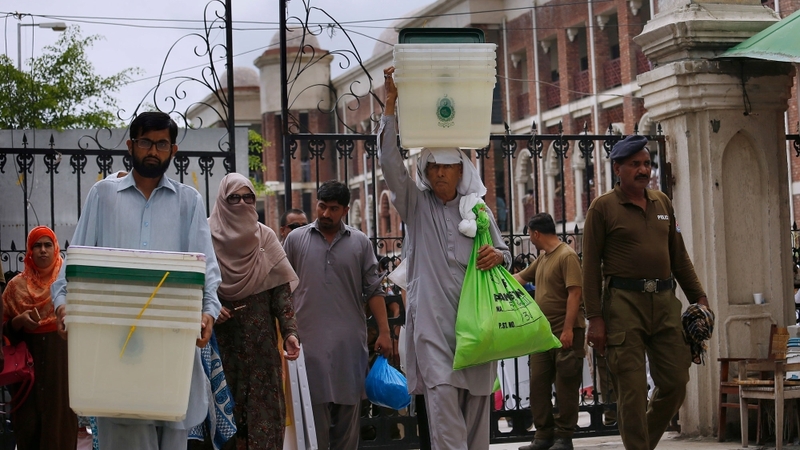 Pakistanis will go to the polls on Wednesday, after a campaign that has seen allegations against the military of tampering, but would nonetheless be the second civilian-to-civilian handover of power in the country’s history. Voting will open at more than 85,000 polling stations at 8am (03:00 GMT) and close at 6pm. Results are expected to trickle in several hours later, the election commission says. On Tuesday, ballot boxes, papers and other election paraphernalia was transported to the stations, under armed guard. The military has deployed more than 371,000 personnel to provide security inside and outside every station. “We are trying our best to deliver free, fair and unbiased elections in Pakistan,” said Sardar Muhammad Raza, the chief election commissioner, in a video message on Tuesday. Votes will be cast for 272 members of the lower house of parliament, as well as for the country’s four provincial assemblies. The campaign season has seen a slew of allegations traded between the country’s top three parties, Pakistan Muslim League-Nawaz (PML-N), Pakistan Tehreek-e-Insaf (PTI) and Pakistan Peoples Party (PPP). Leaders of the PML-N and Bilawal Bhutto Zardari’s PPP have accused the country’s powerful military of intimidating supporters and forcing candidates to switch allegiances. At least 20 PML-N members left the party in the weeks leading to the vote, either joining the PTI or choosing to run as independent. On July 13, PML-N chief Nawaz Sharif was arrested after being convicted by an anti-corruption court following a 10-month trial. Nawaz’s brother Shehbaz is contesting the election as the party’s presumptive nominee for prime minister. The PTI, led by cricketer-turned-politician Imran Khan, has dismissed allegations that the military has been intervening on its behalf, terming the charges “a foreign conspiracy”. The military also denies it has any direct role in politics. The Human Rights Commission of Pakistan (HRCP), an independent watchdog, has however described the election as “the dirtiest in the country’s history”. In a statement earlier this month, it said it was concerned over “blatant, aggressive and unabashed attempts” to manipulate the outcome of the elections. “While it is critical that the polls are held as scheduled, there are now ample grounds to doubt their legitimacy,” the statement said. Accurate polling data is scant. The country’s most populous province of Punjab – also the PML-N’s heartland – is expected to determine who comes into power. There has also been concern over the so-called “mainstreaming” of armed groups into politics, with the far-right Ahle Sunnat Wal Jammat and Milli Muslim League, both deemed fronts for armed groups by the United Nations, fielding hundreds of candidates in the polls. Security will be tight across the country, after a bloody campaign season saw more than 179 people killed in a series of suicide attacks targeting election rallies. More than 154 people were killed in a single attack in the southwestern town of Mastung, the second deadliest attack ever on Pakistani soil.